A class to debounce signals. 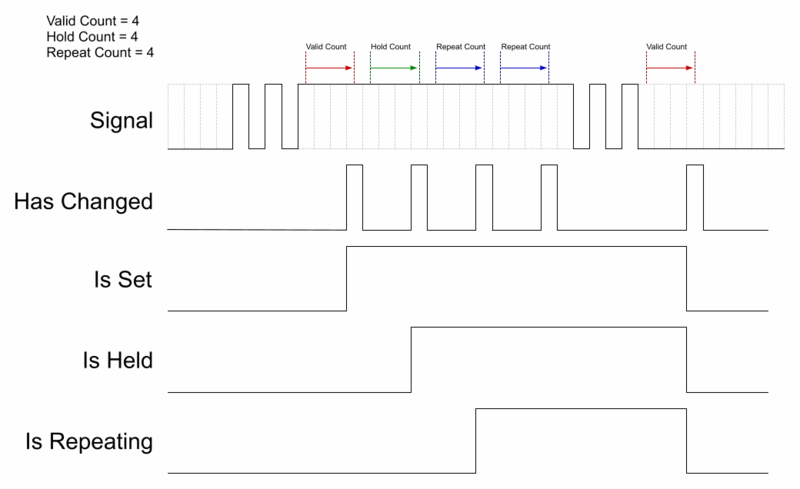 Can detect signal hold and generate auto repeat. There are four variants of the class which are selected at compile time according to the supplied template parameters. All of the template parameters are optional. VALID_COUNT identical samples have been added. true for each REPEAT_COUNT that occurs after entering the hold state. parameters supplied to the constructor or the set member function. The diagram below shows the effect of the various parameters. Default constructor. The initial state defaults to false. The constructor available when no template parameters are supplied. Adds a new signal sample. Returns true if the state of the debouncer becomes valid, held or repeating. Returns true if the debouncer is set, false if cleared. Returns true if the debouncer signal is being held. Returns true if the debouncer signal is repeating. Sets the debouncer parameters. Only available when no template parameters are supplied. Valid after 20 identical samples. Hold detection after 1000 'set' samples. Key debounce with hold and auto repeat. Repeat every 100 samples after hold. The example below targets the Arduino hardware. // A debounce demo that reads a key and toggles the LED. // Set the pin to the correct one for your key. // The sample time in ms.
// The number of samples that must agree before a key state change is recognised. // 50 = 50ms for 1ms sample time. // The number of samples that must agree before a key held state is recognised. // 1000 = 1s for 1ms sample time. // The number of samples that must agree before a key repeat state is recognised. // 200 = 200ms for 1ms sample time. // The pin that the key is attached to. // Initialize LED pin as an output. // Initialize KEY pin as an input. // Assumes 'HIGH' is 'pressed' and 'LOW' is 'released'. // Toggle the LED state on every validated press or repeat.